Digimon: System Restore: Fusion Episode 51: Rotten to the Digi-Core! In this episode, if you want something done right, maybe you shouldn't use the lifeless bodies of your minions while trapping their souls in limbo so they won't revolt. Because they might anyway. This whole notion about fighting the Dark Generals again still doesn't feel all that essential. That's not to say that they aren't good episodes. The execution of the story is perfectly fine and Olegmon and Apollomon closed out their stories with resolutions that are a little happier even if they still end up dead. There's a good parable about an alliance based on trust and friendship against one of subjugation and coercion. It's a tidy lesson for one episode, but hasn't that been the point of the entire season? Perhaps the best indicator of what kind of episode we're dealing with is that it starts out with a ridiculously dramatic, full-length fusion sequence unleashing upon the land the might of... Shoutmon X3. You know, the one that debuted forty-seven episodes ago. The reason for the fanfare is the improbability of forming even that, as Prison Land is only hosting digicores and not physical bodies, and especially since Mikey can make it happen even though he probably shouldn't even have a digicore. This series is a little more vague on the composition of humans in the Digital World than Tamers or Frontier, so it's hard to say. Either way, the fact that Shoutmon X3 isn't totally helpless against the Dark Generals utilizes their unique location. Much like Underworld gave evil alignments an advantage over good, Prison Land rewards stronger souls more than stronger bodies. 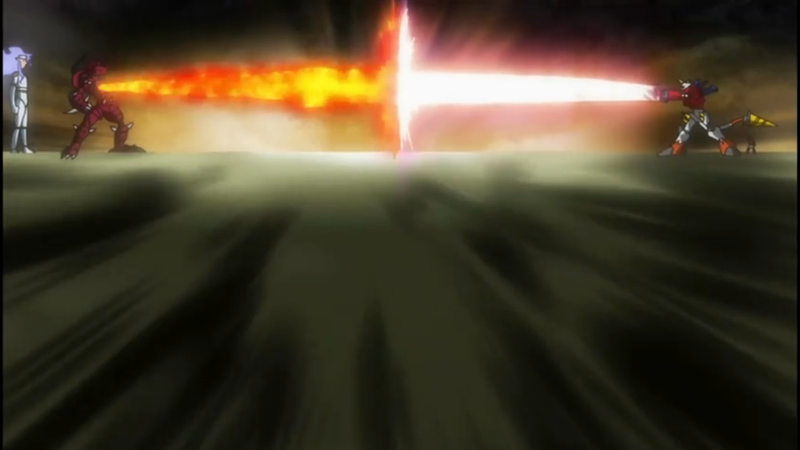 While Shoutmon X3 isn't able to beat all seven, he holds his own against Dorbickmon longer than he should have because they're far more emotionally invested in the battle than any of the Dark Generals. This resolve is a direct response to Mikey being willing to sacrifice his body and join them. Shoutmon, Ballistamon and Dorulumon are not only able to perform above their level, but heal faster than normal after their initial defeat. On the flip side, it's clear that the Dark Generals aren't all that invested in this fight. They love the idea of getting their revenge on Mikey. That drives them early on. What they don't love is answering to anybody. They get snippy when Apollomon Whispered makes some commands and even refuses to call them proper allies, which is part of what persuades Olegmon to jump ship in favor of a side with a real bond. Much later, as the strain of Grand Generamon drains their souls, they realize that AxeKnightmon does not care at all about them and basically surrender. After all, if he really considered them allies, he wouldn't have trapped them in Prison Land in the first place. 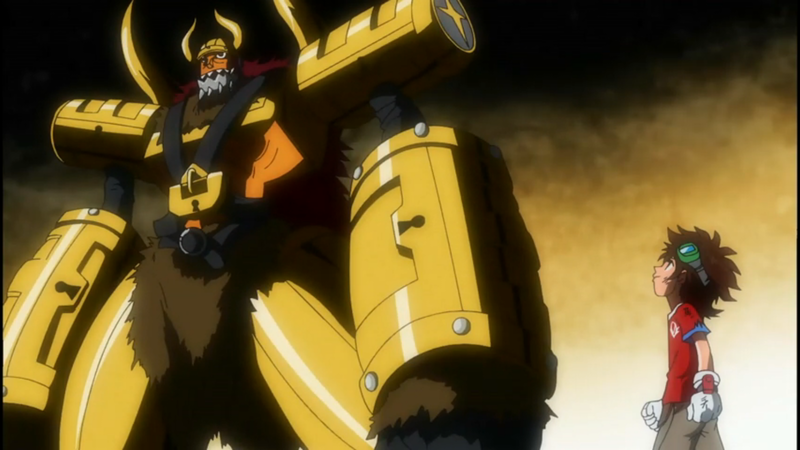 Olegmon is really the driving force of the episode, and its existence might be justified in giving us the chance to cheer for this awesome lug. Sick of their bickering and annoyed with their vengeful motives, he's the symbolic key that Mikey and company are going to be all right. It's easy to love this guy, and it's hard to complain about letting him die a hero. Of course, it's Apollomon who really makes things happen, seizing control again once Whispered starts to have doubts about his mission and his team. Awfully convenient that he had the ability to send Olegmon, Mikey and his team back to their bodies. The real reason the Fusion Fighters are able to succeed is because AxeKnightmon is too insistent on maintaining control. Maybe he's getting paranoid with his endgame in sight. Maybe he's determined not to let outside variables interfere the way they did with Ewan. Maybe he really is incapable of trusting the other Dark Generals, no matter how loyally most of them had served. Maybe it's the same thing we've seen all season long and evil loses because they don't have any faith in their allies. Maybe that's actually a foreboding sign, since Bagramon's lack of hands-on activity this season suggests that he has more faith in his subordinates than anybody. We don't get too much personality out of the five non-turning Dark Generals, but at least we get a line or two from each of them. It's also fitting that the ones who were most isolated like Splashmon were the most annoyed by Apollomon giving the orders, the prideful Dorbickmon takes the first shot on X3, and Gravimon just wants to hurt something. Apollomon and Olegmon seem to have a surprisingly good understanding about the regenerator AxeKnightmon used, where it's located and how to destroy it. It's not like their cores were ever there. Odd that Grand Generamon is re-imagined with only five components instead of his original seven. AxeKnightmon drops an “I find your lack of faith disturbing.” Unexpected place for a Star Wars reference.